A crayon costume is a simple costume that you can easily make at home. All it takes is some colored and black felt and some black clothing. This costume takes little time to create and is a great last-minute group costume. The more people you have dressed up as crayons, the more interesting the costumes look. A crayon costume is also a fun family costume idea. This project will take about one hour to complete. Measure around the person’s body. Cut the colored felt to 2 inches longer than this body measurement. Sew or glue the felt together to make one large tube shape, with the additional 2 inches intended to accommodate the seam. Cut a slit in the back of the costume so you can fit it over the person’s head. You may also need to add a slit to the knees so the person can walk. Add a small strip of Velcro to both sides of the back slit in the costume to hold the slit closed. The costume should sit just under the armpits. Cut out large felt letters from the black felt. 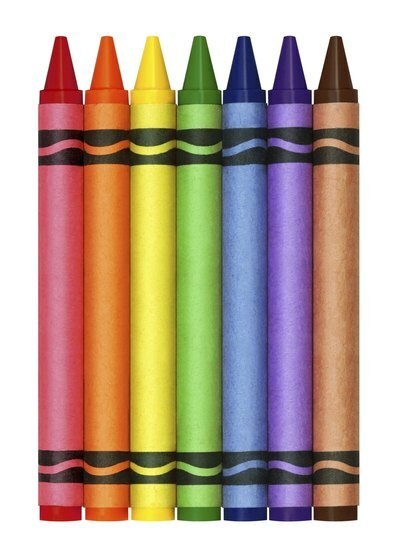 You can either use the word “crayon” or “Crayola.” Cut out the color name, and use craft glue to adhere all the black letters to the the colored felt of the costume. Add a 2-inch wide strip of black felt about 4 inches from the top and bottom edges of the costume to simulate the wrapper. Roll colored construction paper that matches the main costume into a point at one end to make a triangle cone hat. Glue it in place and let it dry. Then place it on top of the person’s head. Glue a piece of elastic to place under the person’s chin to keep the hat from falling off. Put on a black long sleeve shirt, black tights or pants and black shoes under the crayon costume. Put on the costume, then add the hat on top. Consider adding elastic straps that fit over the wearer's shoulders to help the costume stay on.